How much does it cost to travel to Brazil? How much money will you need in Brazil? R$288 ($73) is the average daily price for traveling in Brazil. The average price of food for one day is R$56 ($14). The average price of a hotel for a couple is R$336 ($85). Additional pricing is in the table below. These average travel prices have been collected from other travelers to help you plan your own travel budget. How much money do I need for Brazil? 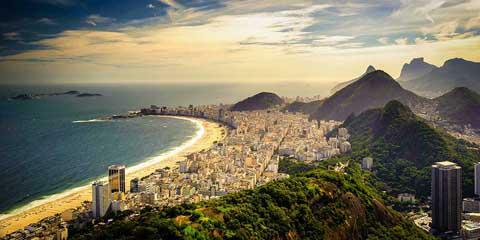 Brazil, the largest country in South America, is also one of the most expensive in the region. It's famous for its incredible cities like Rio de Janeiro and Sao Paulo, and it is known to have one of the best beach and party scenes around. This is epitomized during the famous annual festival, Carnaval. Outside of its cities, Brazil offers the opportunity to explore historic culture, urban oasis, or the wilderness of the Amazon Rainforest. Don't miss the unique Iguacu Falls or the opportunity to attend an adrenaline filled football game. You best option for traveling around the area is by bus. The system is surprisingly convenient and efficient. You can purchase tickets of varying levels, and if you buy the most expensive option you will find the buses to be quite comfortable. The country has only a small handful of train lines left, so unless you have a private vehicle or plan to fly, the buses are your best option. Although this is one of the most expensive countries in South America, there are some ways you can cut down on costs. Probably the most important decision is what season you travel in. During Carnaval all prices become astronomically high. The peak months between December and March also see a substantial increase in costs. If you're hoping to visit Brazil on a budget, travel at another time of year and you'll find you can stretch your dollar much farther. Accommodation can also be expensive here, particularly if you're a single traveler. Single rooms are often as expensive as double rooms. If you can make a friend on the road that you're comfortable splitting a room with you'll cut your costs in half. There are some good budget food options around the country. Pick up some Coxinha and carry them with you, particularly during long bus trips. These deep fried chicken pockets are cheap, good, and reliable and make a great snack on the road. Brazil is a diverse country, with cosmopolitan cities, beautiful beaches, and impressive historic sites, making it obvious why it is one of the most popular (and expensive) destinations within South America. If you're planning to fly into Brazil, you'll find that you can get the cheapest plane tickets beginning in February after Carnaval. The rates remain low until May when they rise again. From August until November you can also get some good deals. The largest airport in the country is Sao Paulo-Guarulhos International Airport, and the second largest is Rio de Janeiro-Galeao International Airport. As you arrive in Brazil the federal police will stamp your passport. Look at the number and confirm that the last digit of the number is a "1" and not a "2". A "1" indicates that you have just entered the country, while a "2" means you have left. If they mistakenly stamp your passport with a "2", and you attempt to extend your visa, you may be told to return to your city of arrival to correct the problem. This is best dealt with immediately in order to avoid the hassle. Although renting a car during your trip may increase your flexibility, there are some unusual road rules you should be aware of. If the car in front of you has the left light blinking, they are warning you not to pass. A blinking right signal means it is okay to pass. A car coming in the other direction with flashing lights means to take caution ahead. There may be an animal, accident, or police officer you should be aware of. There are a handful of other rules you may want to research in advance as well. Although biking in the cities is generally not recommended, there are some good roads in the rural areas that you can bike on. Make sure that there is limited traffic, as most cars do not respect cyclists so navigating the roads can be tricky. There are usually extensive bus systems in most cities. They can be confusing and chaotic however, as many cities are served by more than one bus company. You'll rarely find maps of the routes as well. Your best bet is to ask a local which route to take. At the bus stop you may have to flag down your bus as well. Iguacu Falls: This is a breathtaking waterfall that is located on the Parana River which runs along the Brazilian and Argentinian borders. It is one of the top travel destinations in the country. It's a stunning sight that can be visited from either Brazil or Argentina. Both sides of the waterfalls are surrounded by national parks. Carnaval: This is probably the largest carnival celebration in the world. Rio de Janeiro is the place to be for parades, music, costumes, and partying. It's world famous and a not to be missed life experience. If you're traveling to the area during this time, make sure you have reservations well in advance as everything fills up quickly. The Amazon Rainforest: Over half of the Amazon Rainforest is in northern Brazil. The area is some of the most biologically diverse in the world. Here you will find over two million species of insects, 40,000 plant species, and 2,000 types of birds and animals. Visiting the rainforest truly is a once in a lifetime experience. Brazil's cuisine has many international influences. Typical dishes are based on rice and beans, but there are many different regional specialties throughout the country. Some visitors to the area may find the food somewhat monotonous, but if you seek out the local dishes you'll find a wide variety of interesting flavors. Feijoada: This is a hearty and filling stew that is made from black beans, pork and beef. It is usually served with rice, collard greens and sliced oranges. Many Brazilian consider this to be their national dish. Tutu de Feijao: This is an unusual paste that is made from beans and cassava flour. It is often served topped with hard boiled eggs or as a component in another dish. Moqueca Capixaba: This is a fish dish that is made with tomato, onion, cilantro and garlic and cooked slowly. It's essentially a slow cooked stew that has been part of Brazilian cuisine for at least three hundred years. Shopping in Brazil is fantastic and fun. You can pick up unique souvenirs, but some of the most popular are the hand crafted jewelry that are ubiquitous. Havaianas thong sandals are an affordable purchase and can be found at most supermarkets. The smaller shops usually have the fake ones in stock. If you can swing it, pick up a Brazilian woven hammock and bring a piece of the tropical paradise home with you. Finally, a unique gift is a peteca, which is used for a traditional Brazilian game comparable to volleyball.